The tutorial will start to play. It requires Adobe Flash. In full it's 10 minutes, but you can jump to any section -- hover over the “Jump to section” link at the top-left of the tutorial, then choose the feature you want to see. The application help provided with Analyse-it is a complete reference covering all aspects of Analyse-it: how to install Analyse-it, start it, layout datasets, manage reports, and how to use the statistical tests. You can either browse the contents to learn about Analyse-it, or use the index or search to quickly find the right topic. 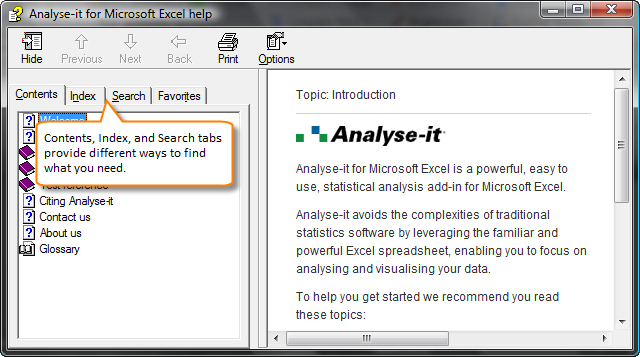 Index and search were only recently added to the help, in Analyse-it 2.10, so if you’re not using the latest version download it now. Most questions arise when using a statistical test -- what are the assumptions for this test, how do I use the test, and how do I interpret the statistics? Help topics for every statistical test in Analyse-it are included, explaining what the test does, what the assumptions are, common tasks using the test, and references to further reading on how the test implemented and the statistics calculated. Choose the test you want to use from the Analyse-it toolbar, or click Edit on the Analyse-it toolbar if you have an Analyse-it report worksheet active. Analyse-it opens the help topic for the test. Sometimes it’s easier to learn from an example -- actually seeing how it's done is easier than reading about it. If you’re stuck and want to see an example dataset and report that you can then use as a template, take a look at the examples. We’ve included sample datasets and reports for almost every statistical test in Analyse-it. Analyse-it opens the examples folder, containing the example Excel workbooks. In future we plan to blog about how to use specific features and statistical tests in Analyse-it. Your comments on these topics will help us ensure we concentrate our time and efforts on problem areas. Post a comment now and tell us what you think of the help and, more importantly, where we can improve it.